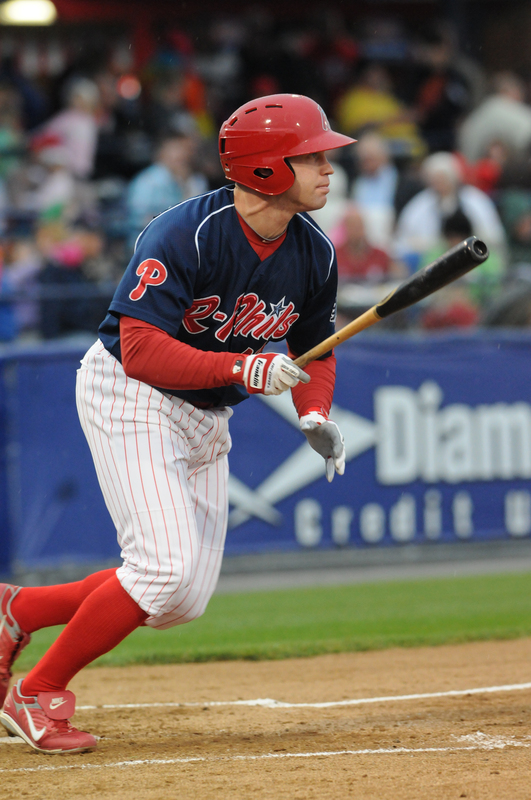 That’s when Port Allegany High School grad and Reading Phillies first baseman/outfielder Brian Stavisky knew it was time to make the tough decision he’d been considering since the beginning of the season: to call it a career after eight and a half years of professional baseball. “From the start of the year, not being an everyday player, it started crossing my mind,” he said shortly after the Class AA team announced his retirement on June 8. “The more I didn’t play, the more I thought about other things. And even when I did play, just not enjoying it like I have in the past – and like I should if I want to continue to play – after having a lot of long discussions and talking about a lot of things, I came to the decision that it was time to retire right now. “I always kind of thought that around 30 I’d know if I was either going to make it to the majors or it would be time to move on. It didn’t really cross my mind – it wasn’t a deadline or anything – but it just kind of worked out that way,” said Stavisky, who will reach that milestone birthday on July 6. So what’s next for the former Port High and Notre Dame star? He plans to spend the rest of the summer in Reading, passing along his baseball knowledge by giving lessons to area youngsters. After that, he hopes to still be involved with coaching or teaching the game, but also find someplace to put his business administration degree to work. “I’ll be looking to get into some kind of business job in sports – the front office of a pro team, or seeing if I can get some type of business position with a college athletic department. I really think that would be my top choice. If I could work on the business side of a college athletic department, being around all the different teams in a college atmosphere, I think I’d love that,” he said. Between high school, college, and the minor leagues, Stavisky has played in over a thousand games, topping out at Triple-A Sacramento in 2006-7. He ends his professional career with 875 hits in 2879 at-bats for a .304 average, including 82 home runs, 20 triples, 201 doubles, and 443 RBI. There were plenty of individual achievements along the way: various all-star teams and All-American mentions, school records, the walkoff home run against Rice in the College World Series, earning the California League MVP award in 2004. But to people who know him, it should come as no surprise that Stavisky mentioned none of those when asked for the one thing he’ll take away from his time in professional baseball. “The four championship teams I was on, I think that’s the thing I’m going to remember,” he said of his league titles with the Modesto A’s (California League, 2004), Midland RockHounds (Texas League, 2005), Sacramento River Cats (Pacific Coast League and Bricktown Showdown, 2007), and Arkansas Travelers (Texas League, 2008). “That stands out the most – the championships, the celebrations, the culmination of a long season. And not being able to do it once, but four times, shows that I played with a lot of good players, had good coaches. We had good teams. That’s the one thing I’ll remember, coming together to win those championships,” he said. That and his hometown fans, who he made sure to mention. “I want to really emphasize how much I appreciate everyone’s support through all the years I played, to just say thanks to everyone that’s followed me and supported me from when I was a kid all the way through high school, college, and then pro ball. I can’t thank everyone enough for the different things people have done for me, and followed me through all the years I’ve played baseball,” he said. Partly because of that, after crisscrossing the country in the A’s and Angels organizations, Stavisky feels fortunate to have made it back to the East Coast for his final two seasons with the Phillies. “Playing here in Reading isn’t far from home, but even some of the other places in the league we played (Altoona, Erie, Harrisburg, Binghamton), a lot of people from home – and a lot of relatives that never got to see me play pro ball, too – at least they got to see me. I was glad to have that opportunity before I retired. Of course, that support started at home, with parents Dan and Mary Stavisky backing him throughout his career and beyond. “There isn’t anyone that’s been more supportive than Mom and Dad, for getting me to everyplace I’ve needed to be, for making the effort to put me in position to have opportunities,” he said. “They were always there, driving to games, flying to see me … Sometimes you think, ‘Well, parents are supposed to do that,’ but I couldn’t have asked for better parents.